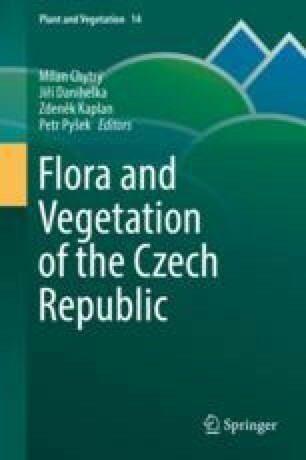 The Czech Republic belongs to the temperate broad-leaved deciduous forest biome for its largest part, but two of its dry lowland areas belong to the forest-steppe biome. Landscapes corresponding to the coniferous forest biome and alpine tundra occur mainly as temperate orobiomes in small areas. Eight altitudinal vegetation belts from lowland to alpine are distinguished. There are high diversities of different vegetation types mainly in deep river valleys in the Bohemian Massif, karst areas, sandstone pseudokarst areas, on solitary volcanic hills, in glacial cirques, lowland riverine landscapes and serpentinite areas. Potential natural vegetation across most of the country is deciduous and mixed forests of beech, oak, hornbeam and noble hardwoods, and coniferous forests of spruce and fir. However, large areas of these forests have been cleared or converted into forest plantations. Open landscape is covered mainly by arable land and perennial grassland. Diversity, ecology, distribution, history and dynamics of the different vegetation types defined in the national vegetation classification are described here in detail. I thank Jiří Danihelka, Petr Pyšek and Marinus Werger for critical reading and comments on a previous version of this chapter, Jan Divíšek, Václav Treml and Tomáš Vrška for the original GIS data from their research, Ondřej Hájek for preparing the maps, Jan Divíšek for an R script for recalculating species richness based on the species–area relationship, Kryštof Chytrý for preparing the photographic plates, Pavel Dřevojan and Zuzana Sixtová for editing the list of references, Tony Dixon for proof-reading the English text and Irena Axmanová for her help with proof correcting. This work was supported by the Czech Science Foundation (project no. 14-36079G, Centre of Excellence Pladias).